Envato changed their terms and conditions for item support (On September 1st, 2015) and introduced paid item support for ThemeForest and CodeCanyon. When you purchase a theme, you will be granted an inclusive 6 months of hands-on support for that item. When this expires you can choose to extend your item support for a further 6/12 months at a fee. Please continue reading below to learn more about item support, or Click Here To Read Envato’s ‘What Is Item Support?’ Article. You are eligible to renew or extend your support subscription if you have less than 6 months support remaining. The cost of purchasing support can vary according to the different periods of your subscription. For example, extending your support subscription while it’s still active costs less than renewing it when it has expired. To learn more about this, please read Envato’s ‘Extending and Renewing Item Support’ article found here. 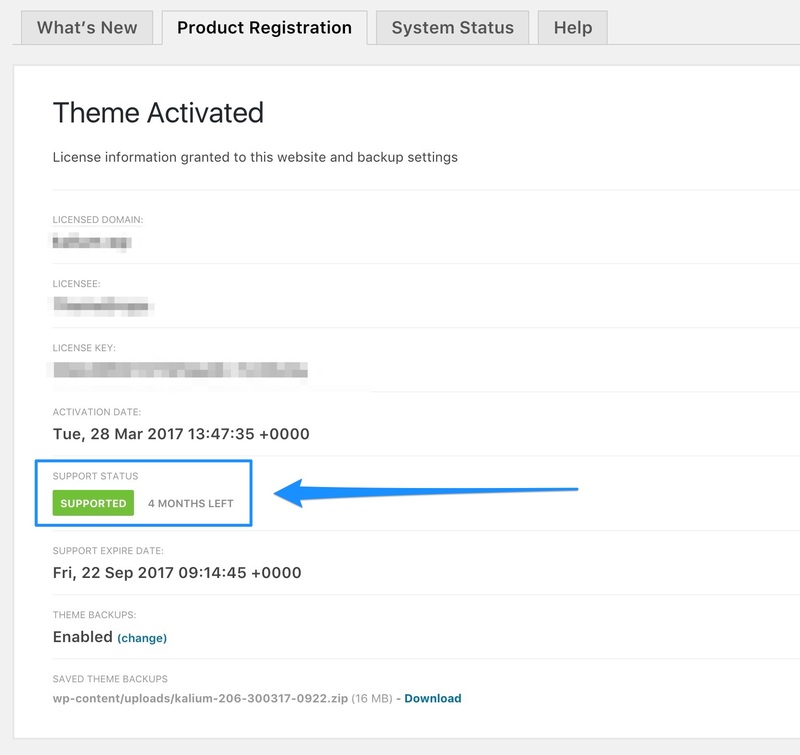 Envato usually sends an email when your support subscription is about to expire in the next couple of weeks, you also will be prompted with a message while you are working on your theme backend and you can also check your support status by going to Laborator > Product Registration page. What Will Happen If I Do Not Renew The Item Support? The only thing that changes is that you will not be granted access to hands-on support. You will, however, continue to receive theme updates that contain bug fixes, patches and new features and access to our online documentation. When Can I Renew The Item Support? There are 3 scenarios for when you can extend or renew item support: At the time of purchase, during your support period, and after your item support has expired. At the time of purchasing the item. This will cost 30% of the list price, or 37.5% on the item price. Support Upgrade – At the time of purchasing the item. This will cost 37.5% on the item price. 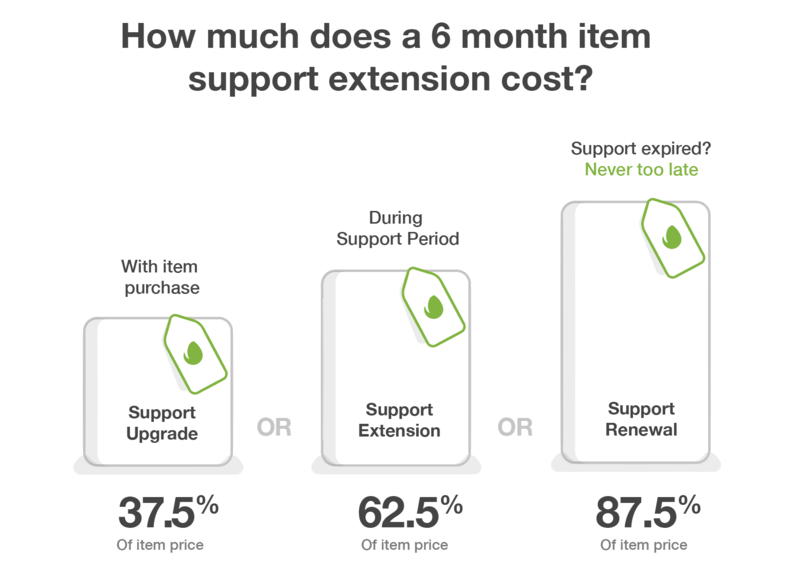 Support Extension – Extend item support before it expires. This will cost 62.5% on the item price. Support Renewal – Renew item support once it has expired. This will cost 87.5% on the item price. Why my Product Registration page shows support expired even that I have renewed my support? 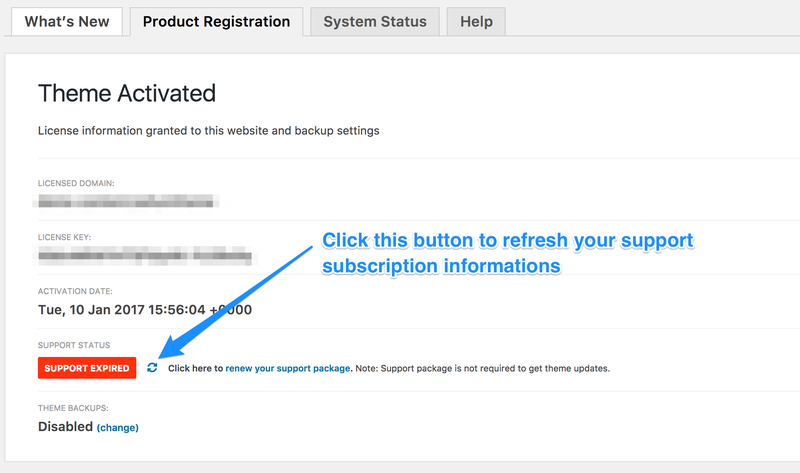 When you renewed your item support and you still see that message, you just need to go to Laborator > Product Registration page and re-validate license date by clicking the “refresh” button.